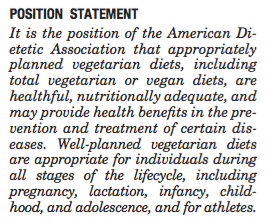 Having read that, it should be clear why she thinks she has a civic duty to scare people away from eating a vegan diet. She has to save her audience from avoiding heart disease! So what does she have to say? You know you are dealing with a deep thinker when she uses the “veganism isn’t exactly the magic health bullet” line. Knowledgeable people call that a straw man fallacy. Start off by failing to define "the diet” you are criticizing, then pretend that someone somewhere is claiming it is a “magic health bullet,” then show that its not so. She follows that with what would be an outright lie. “For starters, the diet doesn’t provide certain essential nutrients like calcium and iron.” “The diet”? What diet? Here she is pretending that there is only one possible possible vegan diet, a common mistake of people who don't think or don't want to deal with reality, but only with the straw man images they create in their imaginations. I will deal with her iron and calcium claim in more detail below. First she implies that only “media outlets” consider tofu and tempeh health-promoting foods. Perhaps she is unaware that these are traditional foods in Asian nations? Do a search on PubMed and you will find a large body of research that has indicated their beneficial properties in prevention of cardiovascular disease and breast cancer if they – or for that matter, other legumes – are used as replacements for animal source foods as in Asia. Next she says that “fake meats” contain “iffy” – yes, that’s a technical, scientific term – filler ingredients, but provides only one example, “processed mold.” She’s long on cranking emotion (“ew”) and short on facts. Since she fails to identify any “iffy” ingredients other than “processed mold” I’ll assume she couldn’t find any others. Fine. This doesn’t damn any other plant-based meat product. I find it interesting, however, that CSPI thinks no one should eat Quorn because some people are allergic to it, yet routinely advocates consumption of dairy products, to which many people are allergic as well. Does CSPI also say that no one should eat peanuts for the same reason? No. CSPI is simply inconsistent here and I wonder if there is a conflict of interest. CSPI is also a recommends using the Police State to manage people's food choices by imposing taxes on various foods it disapproves of. As a freedom-lover I despise the idea of preventing or "solving" problems by putting a gun to someone's head and taking money from the pocket. Ironically, she’s stabbing at the saturated fat in coconut, which can easily be avoided by people eating plant-based diets, while scaring people about plant-based meats and soy products, which are far lower in saturated fats than animal flesh and dairy products. Where to start. First of all, as with mycoprotein and coconut oil, one can eat a healthy plant-based diet without eating soy. Secondly, if “the amount of soy used in many studies is much higher than the amount people consume in real life,” who are the people she is talking about? The average American? This isn’t showing that “the vegan diet wasn’t good for you” as claimed in her title, its suggesting that people don’t eat enough of soy foods to get their benefits. How exactly is “the diet” to blame for that? Next, she cites Mark Hyman as the source for her second statement, but links to a letter sent by the American Heart Association to the FDA regarding the FDA’s allowance of a cardiovascular health claim for soy protein. I don’t know if Hyman said any of this because she’s not linking to anything he is responsible for. Not a good way to build your reputation, Orlov. That’s exactly what some plant-based dieters do: replace animal proteins with soy products. I routinely consume ~7 ounces of firm tofu daily, providing 28 g of soy protein – the amount the FDA had previously approved for the cardiovascular health claim. By the way, when I eat this much tofu, it alone provides 92% of my calcium requirements (Reference Dietary Intake). But this is only one possible health benefit of soy. Others include cancer and diabetes prevention. Orlov hasn’t shown that soy is without benefits, only that "people" – meaning average Americans – don't eat enough of it to get the benefits. Isn't it ironic that in her attempt to dismiss soy's benefits, she cites a source that says we could get those benefits by eating more of it? Typical scare-mongering without context provided. Almonds are turning California into a desert sink hole? Give me a break. A typical one-ounce serving of almonds or almond butter represents about 25 almonds. At 1.1 gallon of water per almond, that costs 28 gallons of water. According to this article in Huffington Post providing data from the Water Footprint Network, here are the water costs of one ounce of each of the following animal products: cheese 24 gal, eggs 25 gal, butter 42 gal, chicken 32 gal, pork 45 gal, sheep 78 gal, and beef 115 gal. Hence ounce for ounce almonds consume about the same amount of water as either cheese or eggs, and significantly less than chicken, butter, pork, sheep, and beef. However, few people only eat one ounce of any of these animal products as a serving. One egg weighs 2.5 ounces ("Waiter, I'll have half an egg, sunny side up"? ), and typical servings of animal flesh range from 4 - 8 ounces. Production of just one egg consumes more than twice as much water as production of one ounce of almonds, and typical 4-ounce servings of chicken, pork, sheep, and beef consume 128, 180, 312, and 460 gallons of water, or 5, 6, 11, and 16 times as much water as the typical 1-ounce serving of almonds. The fact that Orlov and Mother Jones are blaming almonds for California’s water crisis suggests they don’t know how to find or compare data or do math, or they’re just lying to protect animal food industry. All of these remarks apply to the attempt made by Orlov and Mother Jones to demonize avocados. One whole medium avocado weighs about 5 ounces, and a standard serving is one-fifth of an avocado. Therefore, production of a whole avocado consumes only 23 gallons of water, and a standard serving of avocado consumes only about 5 gallons of water, about the same as a pound of lettuce and much less than any of the animal foods listed above on an ounce basis. If you consider on an actual typical serving basis, production of animal products consumes far more water than production of avocados. But if you’re really worried that eating almonds or avocados is causing the water crisis, simply stop eating them. These aren’t required elements in a vegan diet. Once again, "the diet" is not responsible for the evils. Get that Alex? You might want to read through your sources before you put your foot in your mouth again. As for GMOs, I purchase soy products every week, all either organic or GMO-free. All you need to do is read labels, Alex. She's already completely destroyed her own credibility as a nutrition journalist, and her article doesn't get any better as she moves on to nutrients. Thus, due to the fact that the B-12 in animal flesh is bound up in the food complex, it is not the best source of B-12; and eggs and milk provide relatively little B-12. This article discusses the fact that many people have difficulty extracting B-12 from animal foods, particularly with advancing age. It is not clear whether omnivores have higher levels due to consuming animal foods, or due to greater intake of fortified foods and supplements, but the Framingham Offspring Study suggested that omnivores who do not consume fortified foods and supplements are more highly prone to low B-12 status, casting doubt on the idea that animal foods are the ideal sources. The Framingham study indicates that the most effective way to maintain adequate B-12 levels is the vegan way: use fortified foods or supplements. It is unfortunate that a large proportion of vegans do not do this, but this is not a fault of “the diet” it is a fault of the people. 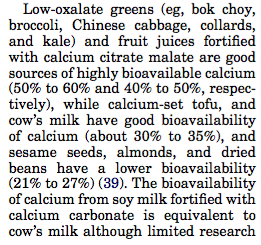 Thus, as a matter of fact, the calcium in dark leafy greens is more bioavailable than that from dairy products. This tends to indicate that humans are best adapted to acquiring calcium from plants. The paleo-diet idea that we can’t get adequate calcium from plant foods without drinking milk or eating bones or bone broth, neither of which is done by our close primate ancestors or could have been done by our paleolithic ancestors is ridiculous. Like our primate ancestors, we are adapted to obtaining adequate calcium from green leafy vegetables and other plant foods. Paleolithic people didn’t use animal milk, they didn’t have a hunting technology that would have enabled them to regularly consume animal flesh, bones themselves are indigestible to humans, they didn’t have pots for making bone broth, and finally, the paleo-diet advocates are always pointing to the animal bones associated with human remains in the fossil record as “evidence” that our ancestors were eating meat...but if the bones are left to dig up then ispso facto the people didn’t eat them. The idea that phytate in plant foods impairs calcium absorption sufficiently to cause calcium deficiency in humans has been disproved by experts on the substance. In fact, we have pretty good evidence that phytate is an essential nutrient for bone health; higher phytate intakes associate with greater bone mass and phytate has been shown to reduce activity of bone cells that break down bone tissue. This makes sense because humans have relied on phytate-rich foods throughout their evolution. Nor do vegans require unusual amounts of calcium. Research shows that vegans who exceed just 525 mg calcium daily – that's about half the Reference Daily Intake – have the same resistance to bone fracture as nonvegans. The fact that some vegans fail to eat adequate amounts of foods rich in calcium is again not a failure of “the diet” it is a failure of vegans who all are picky eaters, poorly informed, or stupidly unconcerned about their own health. Just like the 97% of omnivores who fail to consume adequate potassium which is abundant in plant foods. This article from the Vegetarian Resource Group shows how easy it is to get more than adequate calcium on a plant-based diet. The bioavailability of a nutrient is only part of the story. The other important factor is the amount of the nutrient in the food. If the mean absorption of iron from plant foods is 10% compared to 20% from animal foods, but 2000 kcal of whole plant foods provides on average twice as much iron as a 2000 kcal omnivore diet, in the end the absolute amount of iron absorbed is the same. From an evolutionary perspective, since iron and zinc can be toxic, if a species subsists on foods that have very high levels of these minerals, the species will adapt by absorbing less of these minerals from those foods in order to prevent toxicity. Tracy and I have posted many examples of our daily meals on our YouTube channel showing that our whole foods plant-based diets easily deliver iron in amounts twice the Reference Daily intakes. As I showed in Powered by Plants (page 111), a quantity of wild plant foods sufficient to provide just 80% of energy requirements for an adult woman will provide 8 times the RDI for iron – 210 mg – and 4 times the RDI for zinc (56 mg). If wild plants were to provide 100% of energy, the iron intake would be 262 mg and zinc would be 70 mg, respectively 10 and 5 times requirements; thus it would be necessary for the body to absorb only 10% of the iron and 20% of the zinc. Isn't it amazing how that fits exactly with the known rates of human assimilation of these minerals from plants? Which very well supports my thesis that humans are exquisitely adapted to a whole foods plant-based diet. Considering the fact that consumption of heme iron from animal products or excess iron absorption is linked to significantly increased risk for colon cancer, cardiovascular disease, metabolic syndrome, diabetes (and again), endometrial cancer, and other degenerative diseases, it seems most rational to conclude that humans are not adapted to obtaining iron from animal products. The ADA position paper on vegetarian diets reports that vitamin C and other organic acids in fruits and vegetables can substantially enhance non-heme iron absorption, counteract phytate, and improve iron status. Cooking and fermentation of plant foods also reduce phytate activity. Most importantly, there is no evidence that well-fed vegetarians suffer from iron-deficiency anemia at a higher rate than nonvegetarians. Although the recommended iron intakes for vegetarians are 1.8 times those of nonvegetarians, a whole foods plant-based diet easily supplies that and more, as Tracy and I have shown repeatedly with nutritional analyses of our meals posted on our YouTube channel. 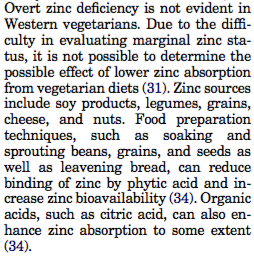 In other words, as with iron, just eating fruits and vegetables with your legumes and grains counterbalances the already minor effects of phytate and enhances zinc absorption. This is not even a food issue. Humans are adapted to obtain vitamin D from sunshine, not foods. A study comparing D levels in British nonvegans to vegans found no more than 8% of either group had low plasma D concentrations in winter and spring months. That means at least 92% of British vegans had adequate plasma vitamin D levels even in the months of lowest sun exposure, in a northern, cloudy nation. Those vegans who had low levels were simply failing to get adequate sun exposure. In fact, the Vitamin D Council states that there is no natural food source of vitamin D that provides a sufficient regular intake to meet human requirements. So, that’s 12 times Alex Orlov showed she is not yet competent to write articles about nutrition, particularly plant-based nutrition. Hopefully she will think twice and get better sources before she embarrasses herself again. Her health claims about calcium and iron is ignorant right off the bat. Just another carnist making excuses for indoctrinated behavour.